My boys love yogurt. Last summer, my little guy really liked Go-Gurt, even for a frozen treat. When I mentioned this to our doctor, she was not thrilled. She said that although it was fabulous that he was eating yogurt., she did not think the sugar content was a good choice. I went home I looked and sure enough, it was pretty high for a regular purchase item. We stopped buying Go-Gurt and the kids were not happy. 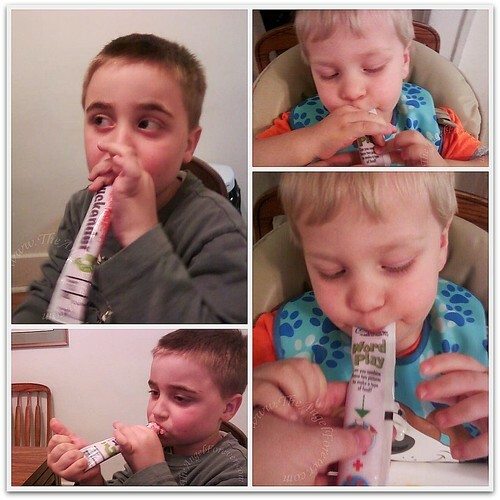 Earlier this spring, I was contacted by MyBlogSpark to participate in a Simply Go-Gurt review and giveaway. I was intrigued because the new Simply Go-Gurts were in the same fun form as the ones we had tried, but they contained less sugar. New Simply… Go-Gurt is made from simple ingredients moms look for and contains no high fructose corn syrup or artificial colors or flavors. Each convenient portable yogurt tube contains a good source of calcium and vitamin D. Simply stated, Simply… Go-Gurt is a good-for-you, low fat yogurt snack that you can feel good about giving to your kids. New Simply… Go-Gurt is available in two kid-friendly flavors, Strawberry and Mixed Berry. 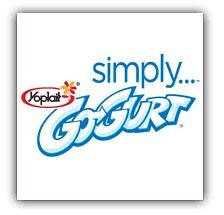 Simply Go-Gurt can be found in grocery stores nation wide. I will admit that we had some difficulty trying to find them a few months ago, but now they are stocked in almost every store that we have locally. Thanks to MyBlogSpark, I have a cute little widget below. The first 30 people to click on it will receive a coupon for a free package of Simply Go-Gurt. After that, you can print off a $1.00 off coupon. Please note that the coupon offer for the free SImply Go-Gurt is not valid in some states, including California, Idaho, Lousiana, Minnesota, New Jersey, Nevada, North Dakota and Tennessee. When our package arrived, the boys loved everything inside (see giveaway photo below). When we went shopping, they helped us to look for the new Simply Go-Gurt . Once we brought it home, NHL and JSL wanted to dig right in. NHL (6) loved the Simply Go-Gurt. He immediately said that he likes how fun they are to eat in the squeeze tube. He had no problem at all eating one and begging for a second. He also mentioned to us that it was not new. I guess that is a great endorsement. NHL clearly did not miss the high fructose corn syrup or colors and enjoyed the new Simply Go-Gurt. The little guy, JSL (just 3), asked for a little assistance with his Simply Go-Gurt. He did not want any to get all over since he liked the taste. After he tried to do it solo, he asked for help to maximize what got into his mouth and minimize loss to a mess. It is important to note that JSL NEVER asks for help unless it is something he really likes and wants to make sure nothing is wasted. When he finished up the first and a second (like his big brother), JSL asked for another and we had to cut him off. We told them they would be there for another day. NHL was nice enough to let me try a little of his, JSL refused to share. I liked the taste as well. It was still sweet, but not overly sweet like the original Go-Gurt had been. The biggest thing I noticed was the color was not shocking and bright like regular Go-Gurt (we can live without bright blue tongues). Kudos to Yoplait for making this option for kiids. This is definitely a step in the right direction to have options for children that do not have HFCS and added colors. I know we will definitely be buying more and likely will have some in the freezer for quick frozen snacks this summer. Thanks to MyBlogSpark and Yoplait, one lucky reader will win a Yoplait Simply Go-Gurt "Simplify Your Life" gift pack like the one I received below. 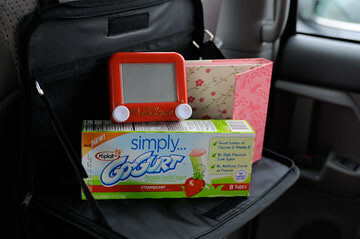 This includes a coupon to try Simply Go-Gurt, a pocket Etch a Sketch, weekly planner and a seat back organizer. . . perfect for upcoming summer trips. Please note that the coupon offer for the free Simply Go-Gurt is not valid in some states, including California, Idaho, Lousiana, Minnesota, New Jersey, Nevada, North Dakota and Tennessee. MAIN RULE – Answer the following question: Share a wholesome snacking tip that makes your child(ren) smile. The following Bonus Entries may also be done. Please be sure to leave separate comments for each that you complete below to make sure you get the right number of entries. 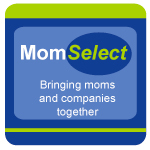 1 Bonus Entry – Share a simple truth about being a parent. 1 Bonus Entry – Subscribe to my RSS feed (or let me know if you already are) in a separate comment. 1 Bonus Entry – Leave a comment on any of my non-giveaway posts from the month of June/July. Be sure to leave a comment here to let me know which one. This Bonus entry may be done only twice per person. 3 Bonus Entries – Add my blog button to your website and leave a link with the location. Be sure to give yourself 3 comments for credit. 5 Bonus Entries – Write a post on your blog linking to my blog about the giveaway. Be sure to leave 5 comments about this to get credit for all of your extra entries. To enter, please follow the rules above within the comment section. Contest starts today July 6 and ends at 10:59 EST on July 14, 2010. You do not have to be a blogger to enter, but must leave a valid e-mail address for me to contact you for mailing address once the giveaway is over. I will select the winner using random.org and contact you via e-mail. You will have 48 hours to claim the prize. If there is no response, another winner will be selected. Open to U.S. residents only. Disclosure: This review and giveaway was made possible by My Blog Spark and Yoplait. They provided me with the gift pack and coupon to purchase a package of Simply Go-Gurt. The opinions of this review were mine and I received no other compensation. Taylor’s most favorite snack is air popped plain popcorn….what he loves about it the most is I put it in a brown paper (lunch size) bag for him to eat….Something about the fun personal serving makes it that much more wonderful. My boys really like graham crackers with almond butter. If I want to make it a little sweet, I add just a few of the mini choc. chips. They think they are getting something really awesome, but I literally only put a sprinkle of the choc. chips! They also love smoothies. I use a combo of fresh/frozen fruits and either yogurt or a splash of milk. If extra sweetness is needed, I use honey, Agave nectar, or dates. I can even throw in a handful of spinach and they drink it right up! For a wholesome snack, you can’t beat sliced apples or oranges! Easy finger food that’s healthy! A simple truth: it’s the hardest but best thing you’ll ever do! We discovered freezing chunks of watermelon and green grapes for a healthy summer treat this year. Delicious and refreshing and healthy too. thanks for the free simply go-gurt from the widget! My sons favorite snack is apple slices with peanut butter. A simple truth about parenting…just when you think you have something figured out, your child will change. 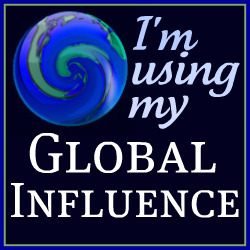 I have your button on my blog. Fresh fruit cut up in fun shapes, finger foods, and cheeses :) *Thanks* for the giveaway! My kids love peanut butter apples!!! My daighter loves apple slices with cinnamon sprinkled on top. Being a parent changes forever, the way you see the world. A wholesome snack tip: having healthy drinks for the angels can be a way to get their daily dose of fruits and veggies ie. V8 fusion is one of our favorites! A simple truth about being a parent is a new found understanding of the word patience!